Thirty-day postoperative complications in overall Achilles tendon repair cohort. Using the American College of Surgeons National Surgical Quality Improvement Program (ACS-NSQIP) database, the authors first identified characteristics that put patients at high risk for 30-day post-operative complications, which included obesity (BMI >30), history of diabetes, or history of smoking. They then identified 1,164 patients for the study, with 615 meeting the criteria for the high-risk cohort, and 549 healthy controls. Using multivariate logistic regression analysis, the researchers found that 2% overall had post-operative complications, with no significant differences between the 2 groups. A subgroup analysis compared ATR with and without graft and found the groups comparable with regard to outcomes. The only difference in this subgroup was operative time (58.34 ± 26.9 mins without graft vs 93.25 ± 40.41 mins with graft). Superficial surgical site infection (defined by NSQIP as an open wound, cellulitis [erythema, tenderness, and swelling] or wound infection noted post-operatively at the surgical site) was the single most common adverse event at 0.9%. 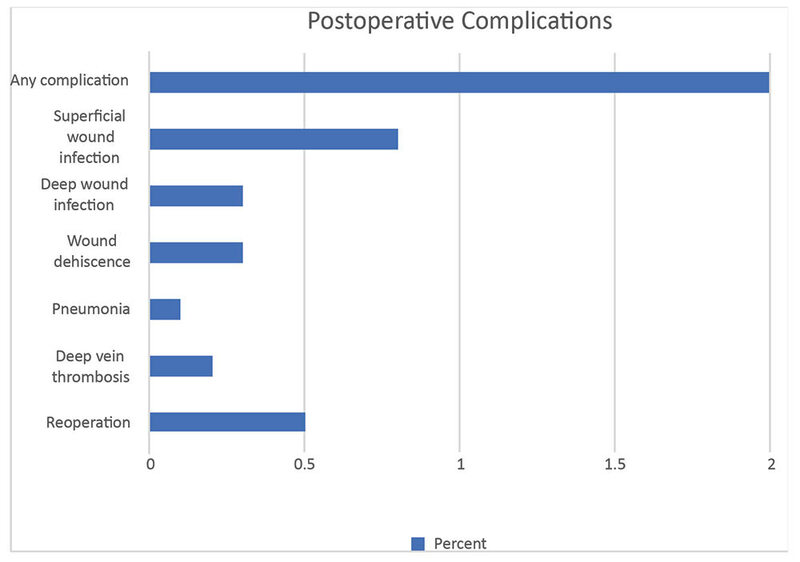 Rates of other complications are shown in the figure. Operative time for the high-risk group was significantly longer at 63.16 ± 30.2 mins, compared with the control groups at 57.95 ± 28.2 mins (P=.002). Overall, the authors found a very low rate of 30-day post-operative complications in the study group, even those with risk factors. Obesity, diabetes, and history of smoking were not seen to increase post-operative complications. The authors note that these data can help inform the provider-patient discussion regarding the benefits of both surgical and non-surgical ATR repair. Clinical relevance: Although diabetes was not seen as a risk factor for post-operative complications in this study, a 2016 meta-analysis2 found that prevalence of tendinopathy was increased in people with diabetes (odds ratio [OR] 3.7, 95% CI, 2.71 to 4.97), diabetes was more prevalent in people with tendinopathy (OR 1.28, 95% CI, 1.10 to 1.49), and the tendons of people with diabetes were thicker than controls (standardized mean difference 0.79, 95% CI, 0.47 to 1.12). Those authors noted that the functional deficits caused by tendinopathies can prevent people with diabetes from adhering to their exercise regimens, which can compromise diabetes control. Furthermore, data3 show that in people with diabetes, Achilles tendinopathy has the potential to increase forefoot pressure, causing a traumatic cascade of plantar forefoot ulcers which can cause deep infection and lead to lower extremity amputation. Thus, actively monitoring these patients to prevent tendinopathies has the potential to improve several patient outcomes. Pean CA, Christiano AV, Rubenstein WJ, et al. Risk factors for complications after primary repair of Achilles tendon ruptures. Clin Res Foot Ankle. 2017;5:244. Ranger TA, Wong AMY, Cook JL, and Gaida JE. Is there an association between tendinopathy and diabetes mellitus? A systematic review with meta-analysis. Br J Sports Med. 2016;50(16):982-989. Batista F, Nery C, Pinzur M, et al. Achilles tendinopathy in diabetes mellitus. Foot Ankle Int. 2008 29(5):498-501.